WSC is serious about servicing your fume scrubber. WSC technicians can deliver scrubber maintenance services. 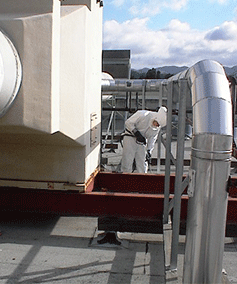 We can design a fume scrubber maintenance program to service your particular requirements. Generally, it will include some or all of the following services: clean packing chamber, vacuum sump and clean pump heads, inspect and clean spray nozzles, clean strainers, clean fan housing and wheel assembly, inspect packing face for build-up, inspect mist eliminator for build-up. Our techs service fume scrubbers monthly, quarterly, semiannually and annually, depending upon customer’s needs. WSC can replace packing media. When packing media becomes channeled or plugged, it needs replacing. A restricted packing chamber results in a pressure drop across the packing. This condition allows air to escape to an area of least resistance and water flowing away from plugged packing chamber. These reductions in surface and water will lead to increased microbial growth and calcifications. The result has resulted in acid being blown out the stack causing downwind damage to equipment andbuildings. When it’s time to repack, we can provide you the best packing and service technicians at the best price. WSC can handle Vibration Analysis and fan balancing. Increasing your systems efficiency and reliability is our goal. We provide vibration analysis to predict bearing failure and balancing fans. WSC can save you money. A scrubber system requires a complicated balance between liquid flow, pressure drop, droplet removal, evaporation rate and equipment size. A change in one can affect the others. Regular maintenance keeps variables of water, exhaust, toxic removal and evaporation rate in balance. 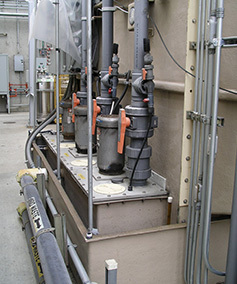 Our customers have found that WSC scrubber maintenance saves money by maximizing fume scrubber and blower efficiency. To see what WSC can do for your facility; contact us today by emailing info@wscnc.com or by phoning (800) 522-9338.